Welcome to what is probably the most complete Schuco Piccolo Shop on the Internet. Please note: We often refer to the items we sell as "toys" however, NONE of the items we sell are intended as toys for little children as the models and "toys" contain small parts and are sold exclusively as collector's items. The introduction of the first Piccolo's was fast and furious... 1957 saw the fist 12 Piccolo's on the market along with 4 airplanes. Most probably the idea of producing high quality and massive small-scale car models was based on the contemporary success of the Wiking models and the very popular 10-Penny cars. Schuco had no choice but to concentrate on trying to capture the essence of the models as it was technically simply not possible to make the models more detailed. 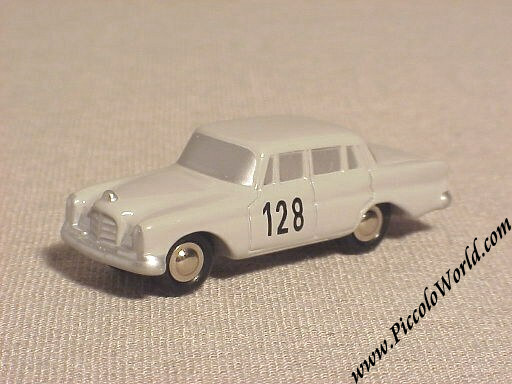 Also Schuco's competition, like Wiking, showed models of an equally "Rubenseque" appearance. The series was a big hit and already one year later, 1958, saw the introduction of another 17 new models. These second series models already showed more detail than the previous ones. A neat example of the improved detail is the filligraine ladder of the Magirus Fire Truck (# 745). The trucks were now made of several parts instead of one solid piece and the MGA and Citroen DS are prime examples of how Schuco had developed and mastered the die casting techniques. It can be traced back that some of the die cast parts of the large Konstruktions Fire Truck were cast in a iron monger close to Schwabach. That was in 1956. It seems logical to assume that also the Piccolo bodies were cast there. As early as 1959, the number of new introductions was already declining. That year saw only 7 new models. In the years thereafter, each years saw only an average of 4 new models. Reason for the decline was the fierce competition of the ca. 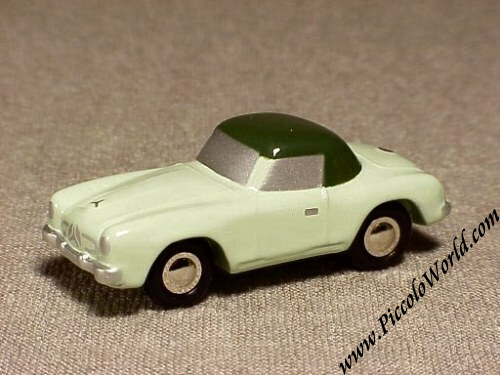 50% cheaper Matchbox models as well as the German-made "Siku Plastic" models. The latter had a little trick to them... a heavy piece of metal was glued inside the bodies and that way they could "ride the wave" of the heavy a valuable models. 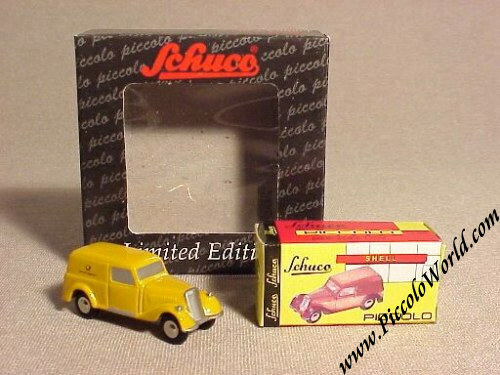 The Schuco Piccolo models were definitely the better models but children primarily think in terms of "volume for money" and "weight for money" and when you only had a little pocket money to spend, the choice was easy. Back in the 1950's, the era of Germany's miraculous economical revival, the toy shops in the suburbs primarily carried items for the "small wallet". The Schuco stores, who always had served the more financially strong, were located in the city centers and failed to serve to masses. As the commodity prices, especially Zinc which was the main "ingredient" for Piccolo's, started to rise by the end of the 1960's, Schuco had no choice but to discontinue the production. In 1969 the last Piccolo's left Nuremberg which the exception of the Coles crane which continued until the bankruptcy of Schuco in 1976. 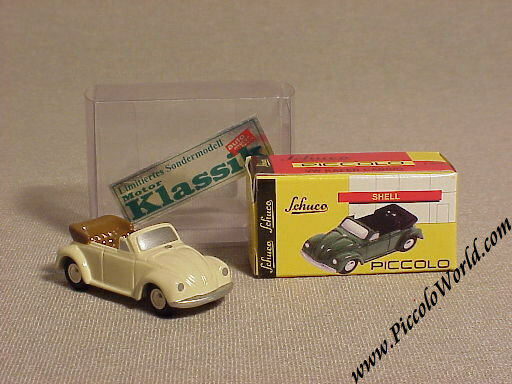 However, the Piccolo range was replaced in the same year, 1969, by the more detailed and true-to-scale series of 1/66 scale. The charm of Piccolo's is not only the always surprisingly high weight but also the beautifully crafted nickel axles and the massive rubber tires. Vintage Piccolo's are hard to get by nowadays and when they can be found, they often show a high degree of "play wear". Absolutely mint items with mint boxes are almost impossible to find. That is also the reason why collectors will pay very high prices for these "untouched" models. Production of the Piccolo cars had seized in 1969. It was only at the end of the 1980's / early 1990's that the Nutz family, who had acquired a number of the original dies, attempted to re-instate the series but Werner Nutz died before he could really get the production started. Most probably, the Hendrix Set was a simultaneous development, NOT headed by Nutz. 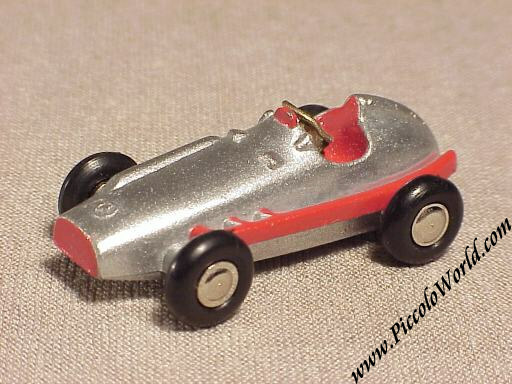 The true Piccolo fans were delighted to see the first "re-issued" Silver Arrows appear on the market in the fall of 1994. 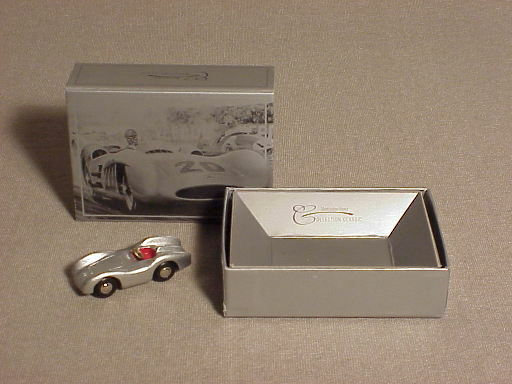 The models were made with the help of Daimler Benz, were sold in a beautifully "etched" drawer-box exclusively through Mercedes Benz dealerships. These models did not carry racing numbers. Only shortly thereafter, in December 1994, the German Veteran car magazine "Motor Klassik" expressed their desire to issue a special version for the Techno Classica show in April 1995. Time was too short to allow for a new model and Daimler Benz was prepared to "donate" 600 pcs of the no-number Silver Arrows. The cars got a black starting number applied but after the first 300 pcs were done, they came to the conclusion that the originals always drove with RED numbers... Hastily they changed the color...These models can easily be distinguished from the later models as the paint is quite rough and on current models it is absolutely smooth. Next step was a Mercedes Benz 1936 Grand Prix car, made especially for the Mercedes Benz Modell Club (MBMC) which lead the way for a wide range of Piccolo promo models. The future of the Piccolo range looks bright and the continuous addition of new models and even model ranges will make sure that Schuco is still around many years from now. New model introductions comprise such items as motorcycles. The only thing that Schuco will not venture into is the re-issue of the old airplane series. After all, Schabak, that rose from the ashes of the old Schuco company, has very well taken care of the range and is thriving on it. One factor of success of the current range is that Schuco does not simply copy the old models. On one side, the re-issues of old models are marked "replica" or "classic" on the bottom plate so that they can always be distinguished from a vintage one and on the other side, the models will also be improved with more details etc. A good example of this is the Volkswagen Karmann Ghia. Also the boxes are not exact copies of the vintage ones. This is again done to prevent them from being passed off as vintage when they are not. 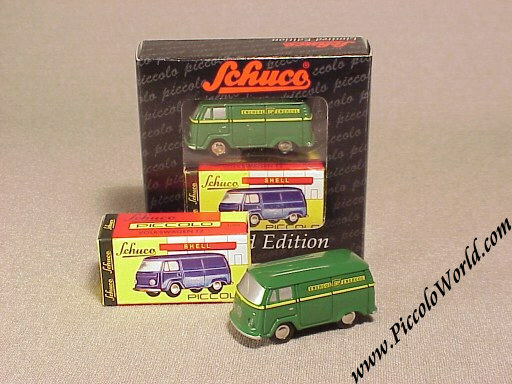 It is a just conclusion to say that Schuco is working with the Piccolo collectors and not against them. Collecting Piccolo's is a joy thanks to the sheer quality of the models and the wide variety that is available and the number of collectors is constantly growing. Ever since the introduction of the first re-issues, the circle of collectors has been growing steadily. It is interesting to see that a good number of women has taken an interest in collecting them. The modern age Piccolo's are now numbered well over 250 when one takes all the promo models into account as well. One portion that is often overlooked is that the basic models have often been available in a number of colors although most collectors restrict themselves to only one color. The normal Piccolo's are often produced in lots of 4,000 of which many are still bought as a toy. Consequently, a large portion of those will go lost over time. The promo models however, are produced in quantities between 1,000 and 3,000 pcs which almost all go straight into collections and not many will go lost. Collecting the promo models is more of a challenge though as in most cases the full production goes to the issuing company and a collector needs a good dealer in order to be able to lay his or her hands on those special models. This is also the reason which some of the recent models have reached a price level which is sometimes hard to believe. 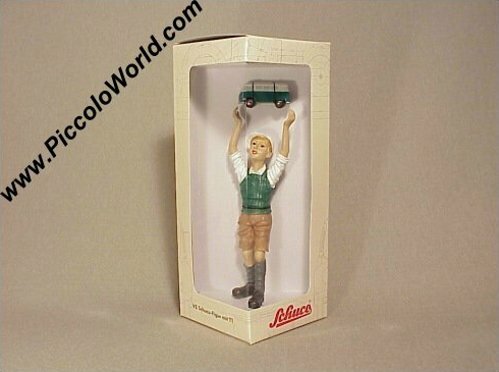 Schuco Piccolo Schoolboy Statue with VW Window Bus. 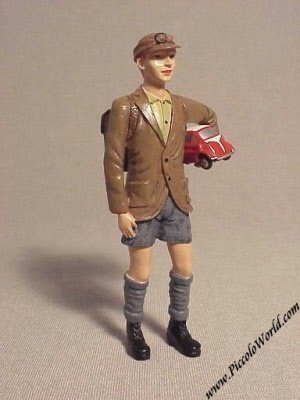 Issued in October 2001, this was the third figurine made for the German Association of Volkswagen Dealerships. This time it is a Schoolboy in white and green clothing carrying a matching colored VW Window bus over his head. The total statue, including the Piccolo measures ca. 7.7 inches ) or ca. 19 cm in height. The total issue was 3,000 pcs. to be sold through Volkswagen Dealerships in Germany only. Schuco Piccolo Mercedes Benz Closed Truck, Christmas 1999. 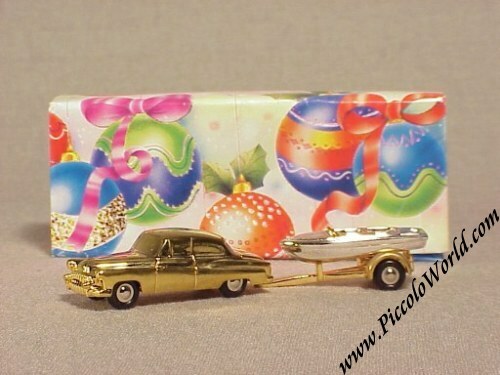 Like every year, also in 1999 Schuco issued a special Christmas version of one of the Piccolo's. In 1999 the choice fell on the Mercedes Benz Articulated lorry with Santa at the wheel. 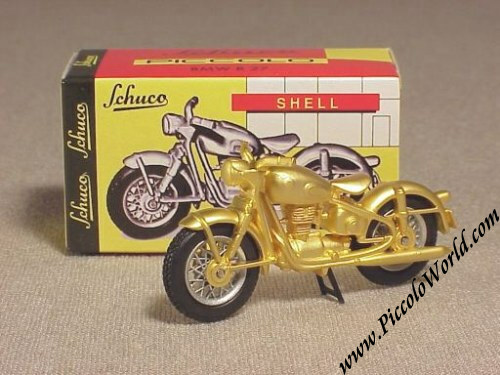 The model comes in a special tin box and comes of course complete with a certificate from Schuco headquarters certifying its authenticity. It was a limited edition of 3,000 sets. 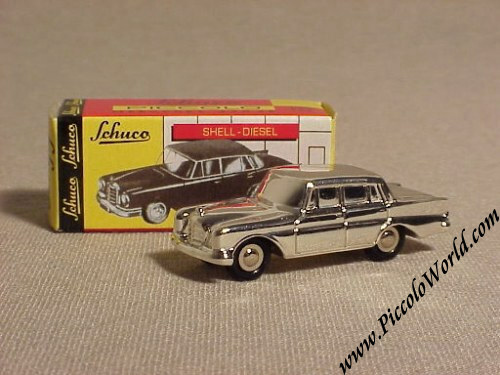 Schuco Piccolo Mercedes Benz 220Se Heckflosse, Chromed. Issued in November 1998, this model was originally part of a Gift Set. It was a limited edition of 2,000 pcs. 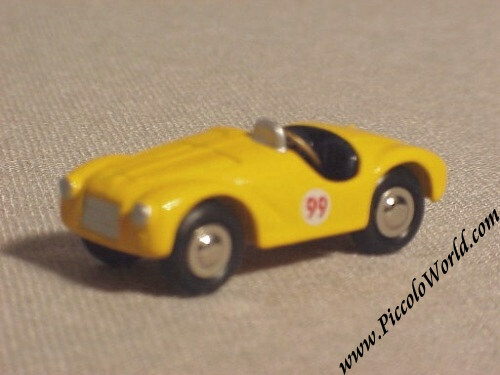 Schuco Piccolo Ferrari Barchetta, Modell Fahrzeug Magazine. Issued in March 1999, it was made at the initiative of the German scale model magazine "Modell Fahrzeug" and issued at the Fazinazion Modellbau '99" exhibition in Sinsheim. It is yellow and carries racing number 99. The over box carries a decal, confirming the above. It was a limited edition of 1,000 pcs. 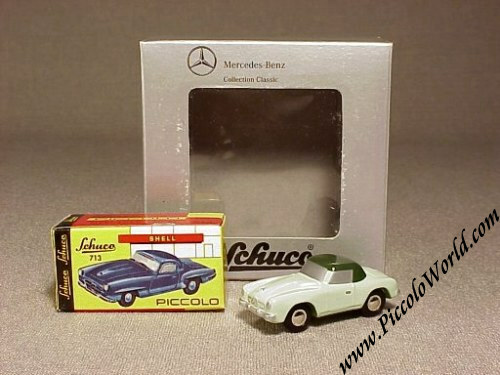 Schuco Piccolo Mercedes Benz 190 SL IAA 1997 Scale Model. Issued in September 1997, it was a promo made for Mercedes Benz for the IAA 1997. The model is two-tone green and comes in a special, silver-colored, Mercedes-Benz Collection Classic over-box. It was a limited Edition of only 1,000 pcs. 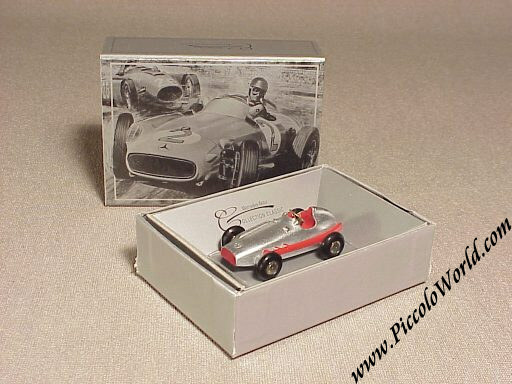 Schuco Piccolo Mercedes Benz 2.5L Grand Prix Car Formel 3 Scale Model. 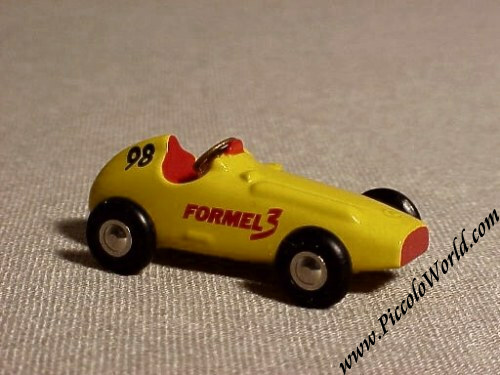 This is the 1998 special, made for the specialist trade and "Formel 3" magazine and issued in July 1998. 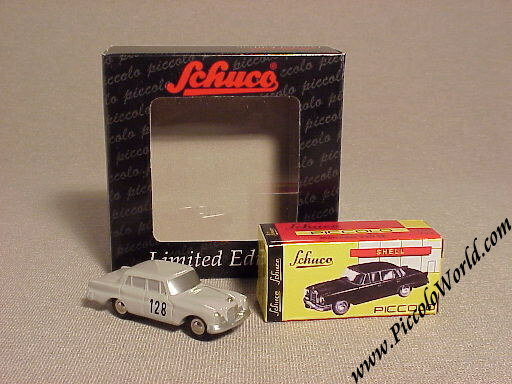 Schuco Piccolo Mercedes Benz 2.5L Grand Prix Car in Drawer Box Scale Model. 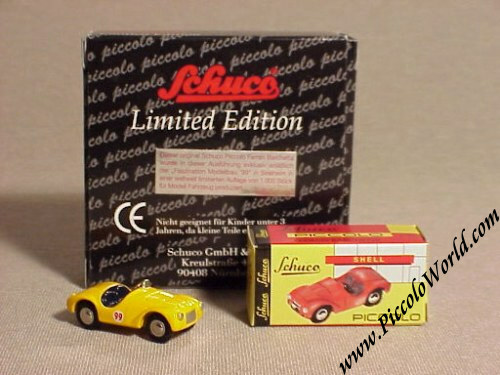 This is one of the series of three that were the first Piccolos to be re-issued by the revived Schuco company and dates back to November 1994. 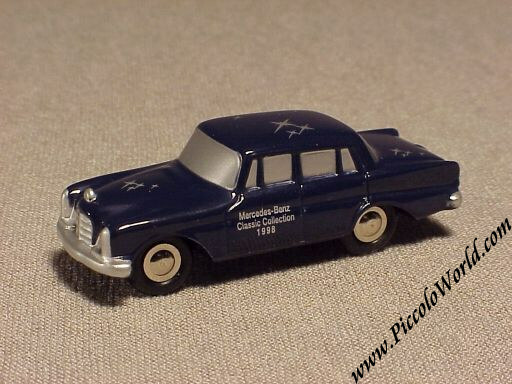 The model was made for the Daimler Benz Museum and it was really this small series that "set off" the renewed interest in Piccolo's. 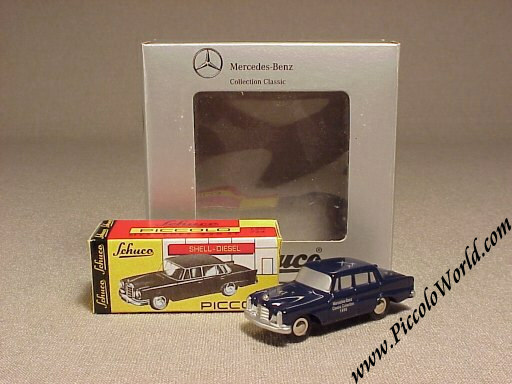 Schuco Piccolo Mercedes Benz 220Se Heckflosse, Classic 1998. Issued in December 1998 and made for the Mercedes-Benz Museum shop. It comes in Navy Blue livery with elaborate print all around. It was a limited edition of only 1,000 pcs and was sold exclusively by Mercedes Benz. Issued in March 2000, this is a limited edition of 3,000 pcs and LONG sold out at the factory. 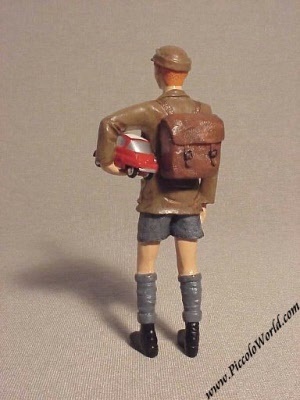 It is a typical 1950's German School Boy carrying a BMW Isetta and stands approximately 5 inches or 12 cm high. 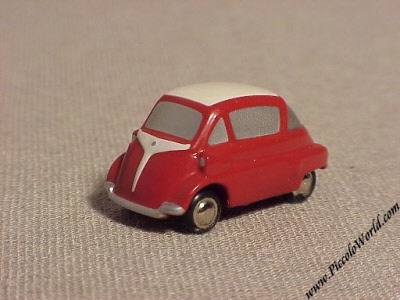 The livery of the Isetta is exclusive to this set. 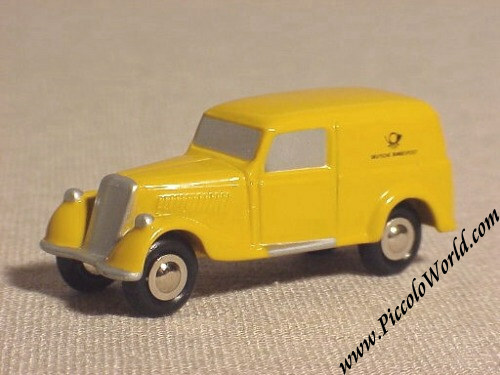 Schuco Piccolo Mercedes Benz 170V Van, Deutsche Post. Issued in Mai 1998, it was destined for the specialist toy trade only. It is a 170V in the livery of Germany's "Deutsche Post" postal livery of the 1950's. It was a limited edition of 4,000 pcs. 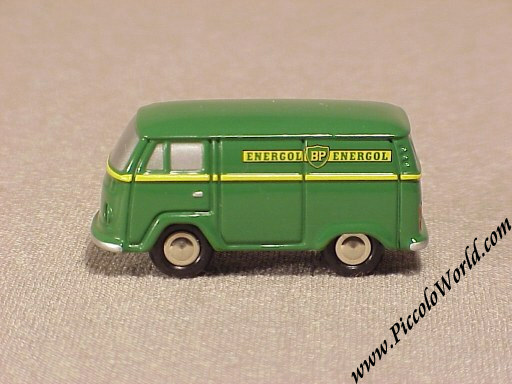 Issued in October 2001, this was the second elaboration of the Typ 2 VW Bus and comes in the livery of a 1960's / 1970's BP Energol delivery van. It was a Limited Edition of a mere 2,000 pcs. destined for the specialist toy trade only. Please note that in the top picture we have used two (2) models. The listed price is for 1 model only. 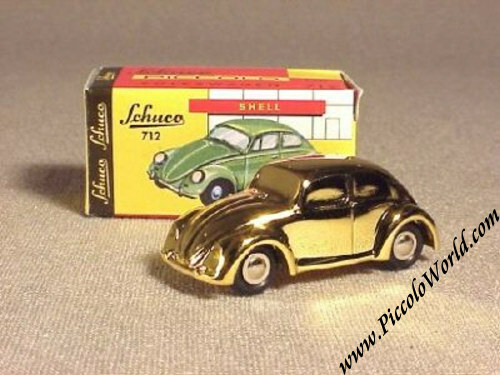 Schuco Piccolo Volkswagen Beetle, Gold-Plated Christmas 1997. Issued in November 1997, this gold-plated Volkswagen Beetle originally belonged to the so-called Christmas Bear Set 1997 which contained a gold-plated beetle, VW Bus and a Schuco bear. The total issue was 1,000 pcs. only. 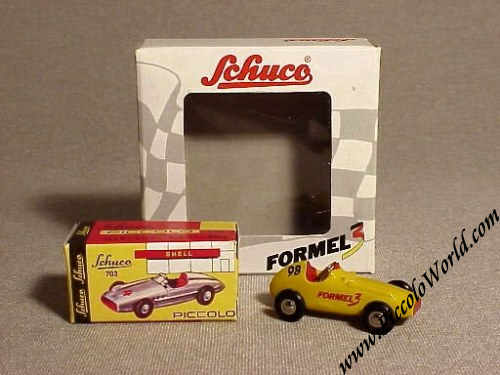 Schuco Piccolo Weihnachten 1996 Set. Issued in December 1996, this was the first of the dealer gifts which in the mean time are a tradition at Schuco. 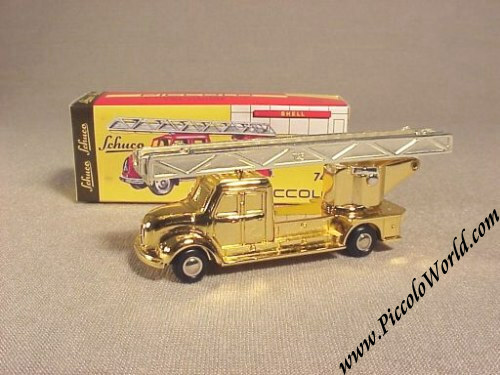 Each year, Schuco rewards its top 1,000 dealers with a special Christmas gift in the shape of a gold-plated Piccolo. Usually, 800 pcs come in blister packaging and 200 come in a wooden chest. This is the version in blister packaging and so it is 1 of only 800. 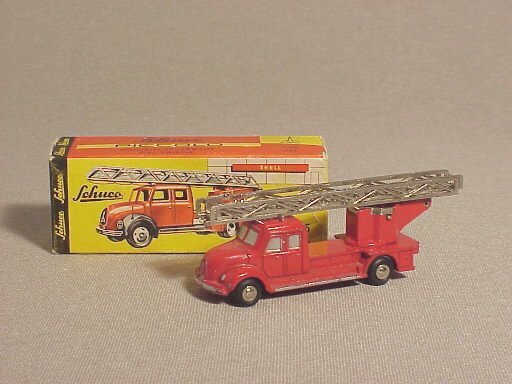 In 1996 the Magirus Fire Truck was chosen to be the Christmas gift. Naturally, these dealer gifts are very scarce on the "free market" as you can imagine that it takes quite some wheeling & dealing to talk a successful Schuco dealer into parting with his "trophy"! 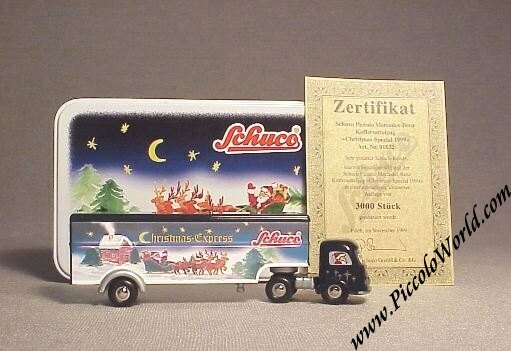 Schuco Piccolo Weihnachten 1999 Set. Issued in December 1999, this was the fourth of the dealer gifts which in the mean time are a tradition at Schuco. This is the version in blister-pack. 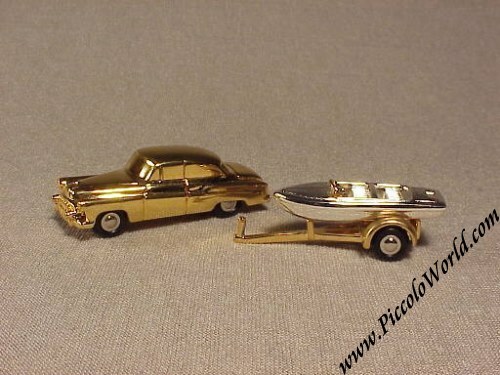 In 1999 the Buick was chosen to be the Christmas gift along with a gold-plated boat trailer and a silver-plated boat. 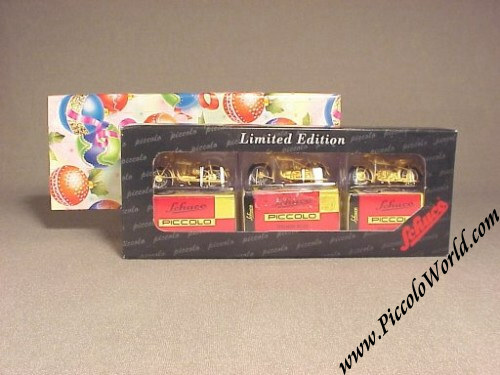 Schuco Piccolo Weihnachten 2000 Set, Blister. Issued in December 2000, this was the fifth of the dealer gifts which in the mean time are a tradition at Schuco. 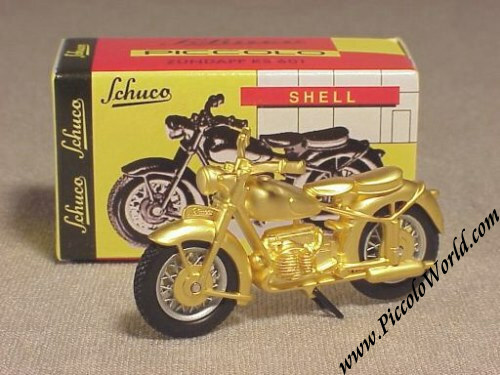 Each year, Schuco rewards its top 1,000 dealers with a special Christmas gift in the shape of one, or more, gold-plated Piccolo's. 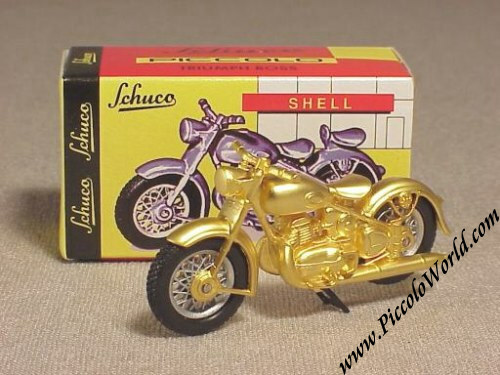 In 2000, the motorcycles, widely regarded as THE most significant addition to the Piccolo range, were chosen but putting them in a wooden chest would leave them exposed to damage too much so the normal packaging was chosen in combination with a special over-box. The set contains 3 Motorcycles (BMW R27, Zundapp KS-601 & Triumph Boss). As the sets are true gifts from Schuco to their dealers, the sets come wrapped in gift-paper. There is one displayed in the background of the first picture. Only 1 set available ! Schuco Piccolo Volkswagen Beetle Cabriolet, Motor Klassik. Issued in September 1997, it was a limited Edition of only 1,500 pcs. It was made for the German Veteran Car Magazine "Motor Klassik". Each box is individually numbered ! Schuco Piccolo Mercedes Benz 220Se Heckflosse, Monte Carlo 1960. Issued in April 2000 and sold exclusively at the Techno Classica Veteran Car Show in Essen, Germany, this is a very desirable Piccolo Mercedes. It comes in the grey livery of the car that competed in the 1960 Monte Carlo Rally. It was a limited edition of only 1,000 pcs and was sold exclusively by Mercedes Benz at said car show. 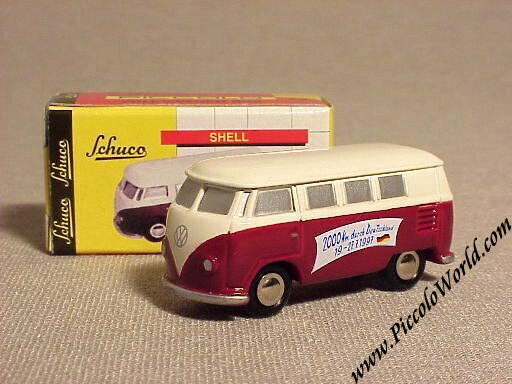 Schuco Piccolo Volkswagen Bus Vivil Scale Model. Issued in June 1997 and of course long sold out. 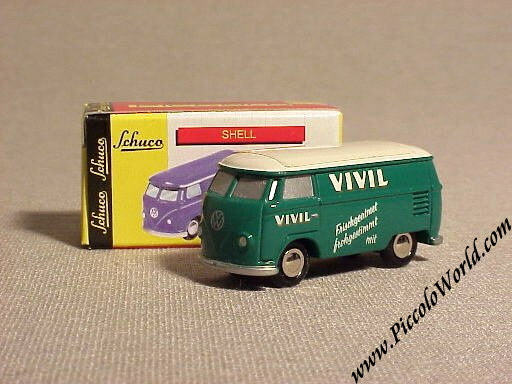 It is a closed VW bus in the livery of Vivil and was made for the Vedes chain of toy stores. Schuco Piccolo Volkswagen Window Bus, 2000 KM durch Deutschland. Issued in July 1997, this model has long been sold-out at the factory. It is a windowed VW bus in two-tone livery and the banner of the "2000KM durch Deutschland" veteran car rally. It was made for the Volkswagen Museum.